Located in the heart of Beverly Hills- Maison 140 is a 3 story- Parisian-style inn- designed with Asian influences and contemporary colors and shapes. The hallways are lined with black textured wallpaper which creates a dramatic contrast to the bold and colorful rooms. Our location is conveniently in walking distance to world-class shopping- restaurants and galleries. 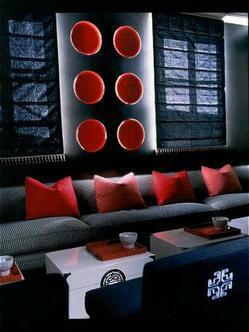 Maison 140 features a popular lounge called Bar Noir- which was voted as Best Hotel Bar by Conde Nast Traveler. We are ideally located close to LAS key corporate offices- Hollywood Studios- medical centers and universities. Each of our rooms also features a spacious desk and high speed internet access- and secretarial services are available by calling our concierge desk.